In many ways, Beau Baldwin is still in Cheney. 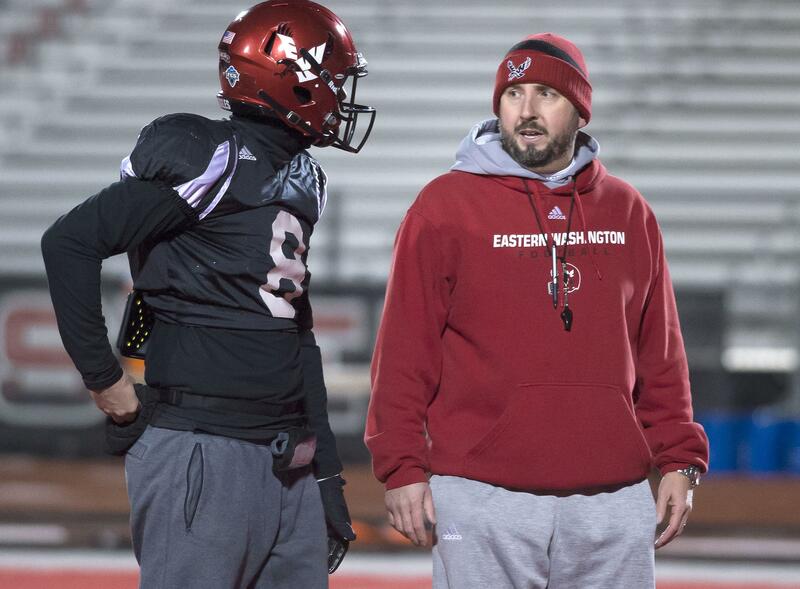 Those are still his guys in red and white – the coaches he hired and almost every current Eastern Washington player. They’ve won four straight without him, and he isn’t surprised. “Not at all,” Baldwin said Wednesday afternoon from Berkeley, California, where he’s preparing California’s offensive game plan for Friday’s game against Washington State. “I knew coach (Aaron) Best would do great. And you can tell that the leaders on the team have stepped up and held the young guys accountable,” said Baldwin, who also finds time to check the Eastern stat sheet. All the way to the bottom of the page. Always one with an eye for detail, Baldwin appreciates the fact that “the younger guys are stepping up” and taking up the slack for the loss of wide receivers Cooper Kupp, Kendrick Bourne and Shaq Hill. That trio departed after the season ended in December. Long before that, Baldwin had several chances to leave that comfortable, successful, happy place in Cheney. Winning will do that. Baldwin claimed five Big Sky Conference titles and a national championship in nine seasons as head coach. But for a lifelong Washingtonian, it was the personal ties, not the titles, which kept him here. That is, until last winter. On the afternoon of Jan. 16, Baldwin announced his decision to become the offensive coordinator at Cal for new coach Justin Wilcox. “I love the ocean, the culture … it’s my first time in a truly big city,” said Baldwin, who’d spent the previous 14 years in Ellensburg or Cheney. Every day from the Cal campus, Baldwin can see the Golden Gate Bridge in the shimmery distance. The view from the bottom of the Pac-12 North standings is another matter. After winning all three of their nonconference games, the Bears have dropped three straight to USC, Oregon and Washington by a combined score of 113-51. Up next is No. 8 Washington State and Mike Leach, who introduced Baldwin to Division I football with a 49-24 whipping administered by Michael Crabtree and the best Texas Tech team in modern history. Four years later, they met again in Pullman in Leach’s first home game at WSU. Heavy underdogs as usual, Eastern took the Cougars down to the final play before falling 24-20. “They played harder than we did,” allowed Leach, who inadvertently did Baldwin a big favor that afternoon. The difference in that game was WSU’s pass rush against pocket passer Kyle Padron. With a bye week to ponder that reality, Baldwin stunned the Big Sky by replacing Padron in the next game with a redshirt freshman named Vernon Adams Jr. Together, Baldwin and Adams made a little history, winning three consecutive Big Sky titles – a first for the program. Later, Leach and Baldwin met occasionally at gatherings in Spokane. Baldwin appreciated the camaraderie from a coach who made roughly 15 times his own salary. “He always treated me as nothing but another college coach, like an equal, and I always appreciate that,” Baldwin said. Leach also appreciates good offensive football, and he was gracious to a fault last year after Eastern upset the Cougars 45-42 in last year’s season opener in Pullman. “They executed more discipline than we did. I think that they’ve done this to a lot of people, and they did it to us,” Leach said. On Friday night, Baldwin will take another shot at Leach and the Cougs. Based on the 14 1/2-point spread, an upset win would be as momentous as last year’s in Pullman. “They’re playing well, especially on the defensive side,” Baldwin said of the eighth-ranked Cougars, who are 6-0 for the first time in 15 years. “They’re playing with what I call ‘chaotic energy,’ but doing it while in incredible control,” Baldwin said. For that he credits third-year WSU defensive coordinator Alex Grinch, with whom he’ll match wits on Friday night in Berkeley. Presumably, their chess game will attract kibitzers all the way to Corvallis, where another Pac-12 school suddenly has a head coaching vacancy. Both Baldwin and Grinch have been mentioned as candidates. No doubt the Beavers are second-guessing their decision not to hire Baldwin in 2014, only a few months after the Eagles knocked off 25th-ranked OSU in the 2013 opener. Nevada, too, has some buyer’s remorse for disdaining Baldwin last winter and going with Jay Norvell. Halfway through the season, the Wolf Pack are 1-5 with a loss to Big Sky doormat Idaho State. A few weeks later, Cal came calling. Make no mistake: Baldwin wants to be a head coach again. But for now, life is good. His wife Nicole and daughters Mia and Macie enjoy the Bay Area as much as he does. His boss, Wilcox, has created an atmosphere that lets Baldwin thrive. “It been a great challenge, but coach Wilcox and the people that are around us have been great. It’s been fun,” Baldwin said. Published: Oct. 11, 2017, 8:07 p.m.